Chromebooks are a powerful learning tool in the classroom. Chromebooks open greater opportunities for children to explore, learn and share their experiences with their classmates and teachers in a safe and secure environment. As of January 2018, over 25 million students and teachers are using Chromebooks for education globally with over 80 million using G Suite for Education. Chromebooks are very versatile and robust to handle the classroom environment. They come in a number of shapes and sizes. The devices are also convertible which means they can either be used as a laptop or as a tablet. The screens are touch sensitive allowing children to use either a stylus or their fingers to navigate around the device. The Chromebooks are powered by the globally recognised Google meaning that support is always there for the life of the device. Updates are automatically installed on all Chromebooks making it one less thing to worry about. One Chromebook can be used by multiple users who can log onto their own secure personal account. Hundreds of children can their personal account easily created and managed by the G Suite console allowing teachers to ensure children can browse safely and effectively. 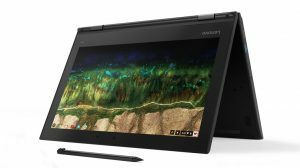 There are a wide range of applications that can be installed onto Chromebooks thanks to the large library of Android applications from Google's Play Store. Apps are even specifically designed and developed for education. 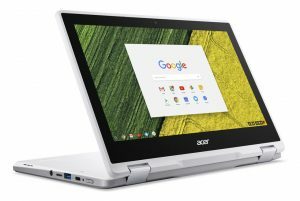 There is a Chromebook for every budget. 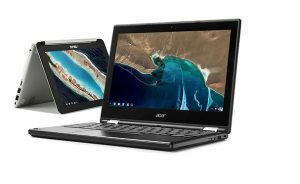 Chromebooks start at a very competitive price as Google understands the tight budgets that schools experience. Please contact us and we will work with you to arrange a quote. We supply Chromebooks through many well known and reliable names such as HP, Lenovo, Acer, Dell, Asus and Viglen.